Tableau has a gigantic smart and fun community! Before TC17 in Las Vegas, a lot of Tableau User Groups are gathering to discuss updates, products, tricks and have fun together. Make sure to join the Events and Conferences: Colorado, New York, Pennsylvania, South Carolina, Illinois, Texas, Massachusetts, New Hampshire and the Kentucky are all in the starting blocks for the United States while the Netherlands and the United Kingdom are boosting their power before the Conference. + There is so much to do at #Data17! Here are a few ways to ensure you'll get the most of the Community experience. + Check out Pooja Gandhi and Adam Crahen's work: #DearDuo! An inspiring and smart project for fun and skills boosting. + Are you a marketer that’s tired of creating reports in excel? Do you get annoyed every time you pull data from multiple platforms to create website traffic reports? Two of Tableau’s own marketers have created a next-level website analytics dashboard, with custom traffic metrics, to make reporting a breeze! They will be sharing their knowledge about Tableau at TC17 during their breakout session. 44 posts have been published this week to help our community, while 39% have been marked as correct and helpful! 557 views, 22 comments, Vasu choudhury almost nailed our community with his question about dynamically showing previous Quarters/Half Yearly values based on Time period selection. Thanks to Norbert Maijoor, Shinichiro Murakami and Yuriy Fal, THEY nailed him down with many excellent and detailed replies. Congratulations to you all, you really are pillars of our community and we can't thank you enough for your dedication. This week I wanted to put the incentive on our Ideas. It really is a great place if you want to propose new features for Tableau, implement new things and directly discuss with our Dev teams. The latter are regularly skimming through your threads in order to gather more feedback from our community, discuss implementations and raise the best detailed ideas for their projects. Enjoy the week, it is cold but very sunny in Dublin this Monday - I hope you're having a great weather as well. I can't wait for snowboarding season early in 2018! Ah... 2018, time flies right? Until next time, happy analyzing! Do you love data analytics? Do you strive to improve processes or geek out over security? Do you believe in the power of understanding data to inspire true innovation? Then, Tableau Conference 2017 is for you! You’ll be among thousands of fellow data people who understand that powerful insights, beautiful visualizations, and surprising revelations are a reason to get out of bed every day. And did we mention they love to have fun? This is where data people gather to learn, collaborate, and network, building a lasting community with the power to make a difference. The excitement is tangible – you’ll feel inspired from the first moment, and build momentum as you discover new tools, techniques, and curiosity. With more than 400 sessions of every level and focus, you’ll learn more in one week than you ever thought possible. From keynotes to breakouts, hands-on training to hands-in-the-air parties, you’ll be in the company of Tableau experts, partners, and customers: it’s data people paradise. Gain new analytic superpowers to take home with you. You can even get certified as a Tableau expert. It’s all happening at the Mandalay Bay in Las Vegas - Oct 9-12.See you there, in a little bit more than two weeks! + Create a viz using your personal fitness data, upload it to Tableau Public, and you’ll be on your way to slipping into some Lululemon apparel! You have until Saturday 30th of September to Submit your viz. + It’s time for another round up of the best of the #Tableau blogosphere! Fresh ideas & new bloggers in our community. Deepak Rai replied to 51 threads while having a dozen of them marked as correct and helpful! Abderrahim Oubidar had a question related to filling some missing values in his data. He had 2 tables that he joins together, the first gives the sales for each day, the other is monthly budget. Guess who solved it? Kalyan Allam: Congratulations, you rock! Luke Brady would like to enable Tableau Desktop to connect to and create an Extract of OneDrive content which is shared with me where I am not the owner. Do you think like Luke? Then upvote and comment his idea! Tableau Conference on Tour landed in Berlin! If you love data — the storytelling, the inspiring calls to action, the success it brings to your business — Tableau Conference On Tour, Berlin is where you belong. Network with hundreds of change-makers from every industry. Get answers to your toughest questions. Get inspired by stellar Tableau and customer keynote speakers. Craft your personal learning journey with hands-on training sessions and one-on-one Tableau Doctor appointments. And best of all, have an amazing experience with the Tableau community – complete with data people as smart and solution-driven as you! Plan Your Tableau Conference on Tour 17 Berlin Experience and find out what else you can do in Berlin. + Fellow data artists this is your moment: Show off your vizzing skills to claim Lululemon gear at Tableau Conference! + Learn how to use benchmarks in Tableau with Yvan Fornes! His different approaches and vizzes are mind-blowing. + Of course, the Tableau on Tour Conference, Berlin, started today! Are you attending this exciting event? 11-13 September. This week, jennifer.vonhagel replied to 49 threads while having 17 of them marked as correct and helpful! Angela Torres needed help with downgrading a file from 10.3 to 10.2 using notepad and changing the version. 1827 views and 10 comments, Joe Oppelt dived in with a proper solution! Welcome to my first weekly digest! Hopefully everyone is having a great Mon.. I mean, Tuesday, as the US celebrated Labor Day on Monday! Labor Day in the United States is a public holiday celebrated on the first Monday in September. It honors the American labor movement and the contributions that workers have made to the strength, prosperity, laws and well-being of the country. In the wake of hurricane Harvey we have seen countless stories on the devastation as well as relief efforts for the victims. The mounting cost of the effort is quickly turning Harvey into one of the costliest hurricanes to ever make landfall! 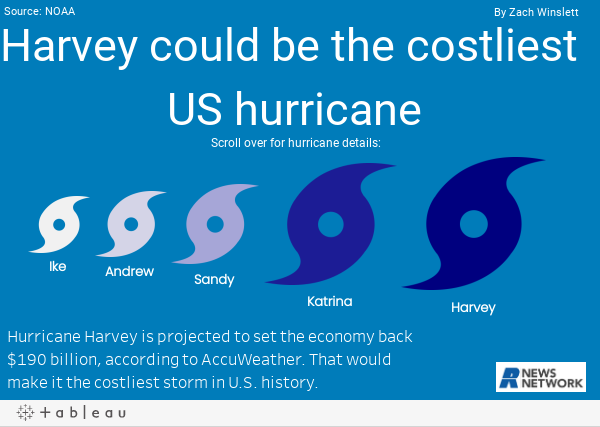 To give a better idea of the costs incurred by other hurricanes Raycom News Network, Raycom News Network | Tableau Public, created the below Tableau Public visual. Harvey is expected to cost upwards of 190 billion dollars. In comparison to the most recent on the chart, hurricane Sandy, which had an estimated cost 70.2 billion. Yvan Fornes recently wrote a blog posted featured on Tableau.com (linked-below) that discusses the use of Tableau and bench-marking. Many industries use benchmarks to determine the performance of a particular campaign, product line, or competition. Tableau allows Yvan to gain insight into the performance against the benchmarks. Big congratulations to community member Hari Ankem on earning the Help one, Help all! badge! This badge is received for having 100 answers marked helpful! The top voted idea this week is Control what displays in View Data originally contributed by Darrin Schulte with 863 votes for this idea and 102 comments. There has been conversation regarding this idea since 2012. Have a suggestion or additional use case to share for the idea? Follow the link and add your vote to learn more and support the idea!